Named after the capital city of Central Java in Indonesia, Semarang. It was created by Chinese immigrants in the city of Semarang. 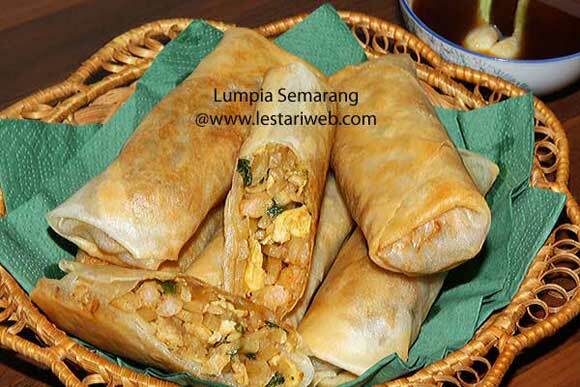 It is filled with bamboo shoots, dried shrimp (ebi in Indonesian) chicken and/or prawn. Filling: Heat 1 tbsp oil in a frying pan, make the scramble egg. Put aside. Heat another 2 tbsp oil, stir-fry the shallot & garlic until fragrant. Add the spring onion & shrimp, stir to mix and cook until the shrimp well cooked. Add the chicken and bamboo shoot, stir to mix. Add the dried shrimp & scramble-egg. Mix them well. Add kecap manis, pepper and salt. Add a little bit sugar if necessary (to taste). Pour in the water/ broth, cook untill all items are well cooked. Lift and let it cool. Preparing the spring rolls: Place the wrapper in front of you, with one corner at the bottom so that it look like a diamond. Put 2 tbsp filling in the bottom part of the wrapper in a thin log shape, avoid touching the edges. Leave the bottom few centimetres clear. Lift the wrapper over the top and tuck it in under the filling. Fold over the left and the right side and roll it up to form a tube. Rub the top edge part with a solvent wheat flavour and ** seal the roll. (If you want to eat it wet / unfried then sealing step is not necessary). Deep fry the spring rolls over a medium-high heat until lightly brown. It should take only a minute or two. Pat dry with kitchen paper or put them on the towelled tray to let them drain. Sauce: Bring all the sauce ingredients into boil and the sauce becomes thick. Remove from heat. 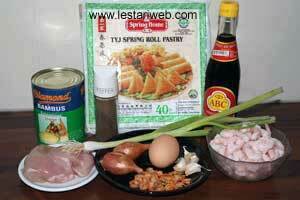 Sweet sour sauce (if preferred): Mix all ingredients and cook untill boiled. Add the solvent corn flour, stir to mix and cook until the sauce becomes thick. Remove from heat. Serve the spring rolls with sauce while hot or you can eat it right away after wrapping if you prefer non fried spring roll.